What Does the MUTCD Say? Inadequate visibility of the intersection or regulatory traffic control devices. Excessive intersection conflicts within or near the intersection. Misjudgment of gaps in traffic. Non-compliance with intersection traffic control devices. The first four problem types comprise issues concerning the perception of the intersection or its traffic control; the next three relate to safety or operational deficiencies; and the last three entail issues of user decision-making and behavior. The existence of one or more of these problems can contribute to crashes at unsignalized intersections and the injuries and fatalities that result. Definitions, explanations, and examples of each problem type are provided below. Definition: The control type—uncontrolled, YIELD sign, or STOP sign—being used is inappropriate for the prevailing conditions considering traffic volumes, speed, and other factors. Explanation: Sections 2B.04 – 2B.10 of the Manual on Uniform Traffic Control Devices (MUTCD) provide standards, guidelines, and options for the selection and application of appropriate traffic control at unsignalized intersections. 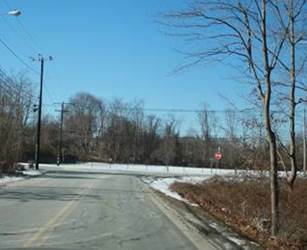 Each state department of transportation also has its standards and guidelines that are similar to the MUTCD. The control at a particular intersection may not be in conformance with the MUTCD or state guidelines, but this may not be obvious to the analyst until data are collected and analyzed. A discussion of the guidelines for the various control types is found in the UIIG’s Selection of Appropriate Control. Insufficient sight distance from the minor road to and along the major road. 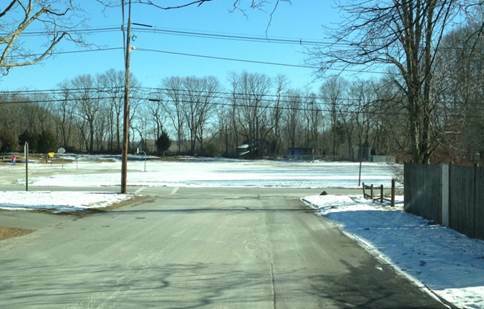 This uncontrolled intersection should have a STOP or YIELD sign on this approach. Source: VHB. Definition: The motorists’ ability to see an upcoming intersection and/or the intersection traffic control sign along that approach is limited. Explanation: Regardless of the traffic control used, the intersection should be visible far enough in advance so that the motorist is able to react appropriately and safely. A basic principle of highway design is to provide enough stopping sight distance continuously along each highway or street such that drivers can stop if necessary (under yield control) or if required (under stop control). The minimum sight distance (visibility) depends on the control that exists. For an uncontrolled intersection, motorists approaching from all directions should be able to see not just the intersection but also the opposing minor street approaches from a distance that would be sufficient for them to safely react. If the intersection is controlled by a STOP or YIELD sign, the motorist approaching on the major road should be able to see the intersection from at least the stopping sight distance. The minimum stopping sight distance depends on the design speed of the road. Published by the American Association of State Highway and Transportation Officials (AASHTO) and commonly referred to as the Green Book, the national design guide A Policy on Geometric Design of Highways and Streets provides direction on how to determine the appropriate stopping sight distance for a given location. The stopping sight distances for various design speeds on a level road are shown in the following table. Stopping sight distance on a level road. Source: Table 3-1, A Policy on Geometric Design of Highways and Streets, 6th Edition, AASHTO, 2011. Sight distance to and from the intersection can be measured directly during a field survey. The Iowa State University Center for Transportation Research and Education developed a Handbook of Simplified Practice for Traffic Studies, which includes an explanation of sight distance and how it can be measured. If the requisite stopping sight distance is not available, then an advance intersection warning sign or other treatment may be necessary. Examples: Road users may have inadequate visibility of intersections that are (1) on the crest of a hill (see the photograph below), (2) within or near a horizontal curve, or (3) hidden by an overpass or other structure. The intersection just beyond the crest of this hill is not visible to approaching motorists. Source: VHB. In the example below, the intersection is visible but not obvious from further upstream, as the STOP sign on the minor street is not visible to approaching minor street drivers until they are very close to it. The large turning radius provided at the intersection has led the agency to place the STOP sign at a considerable offset from the view of the motorist approaching along the minor street. The STOP sign is not visible to approaching vehicles (left) due to its placement toward the end of the large corner radius at the intersection (right). Source: VHB. Definition: Motorists do not have sufficient visibility of oncoming vehicles on both approaches of the intersecting street to safely enter or cross the intersection. Explanation: For intersections at which only the minor road approaches are stop-controlled, the minor road intersection sight distance is the length visible along both approaches of the major street. Intersection sight distance is measured using approach sight triangles or departure sight triangles, depending on the control at the intersection. The sight triangle is formed by the two legs of the opposing streets and depends on the operating speed and the traffic control of the intersecting roadways. The users’ view within the triangle should be unobstructed. There are several scenarios that relate intersection sight distance to the type of control and vehicle maneuver. These scenarios are described below; more information and guidance can be found in the AASHTO Green Book. Case A – Intersections with No Control. For an intersection with no control, drivers should be able to see potentially-conflicting vehicles on all approaches with enough warning such that they can stop before entering the intersection. Having a clear sight triangle on all approaches allows for vehicles on either road to stop, if needed, before reaching the intersection. For left turns, the sight distance is determined by the time it takes stopped vehicles to turn left and accelerate to the running speed of the traffic coming from the right without affecting the speed of the nearest approaching vehicle. For right turns, the distance is determined by the time necessary to turn right and accelerate to the posted speed limit without being overtaken by an approaching vehicle. For vehicles crossing over the major street, the distance is determined by the time needed to cross the intersection without affecting the speed of approaching vehicles. Case C – Intersections with YIELD Control on the Minor Road. Drivers approaching an intersection controlled by a YIELD sign are allowed to enter or cross the major road without stopping if there are no potentially conflicting vehicles on the major road. Similar to Case B, the sight distances depend on the maneuver of the departing vehicle. YIELD-controlled approaches need greater sight distance than STOP-controlled approaches because the decision to stop must be made before arriving at the intersection. Included within this problem type are skewed intersections, where one or more legs connect at some angle notably less than 90 degrees. 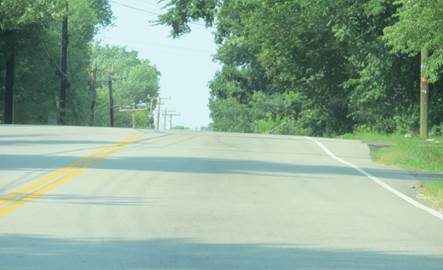 At these locations, it may be difficult for many drivers to readily view oncoming vehicles. 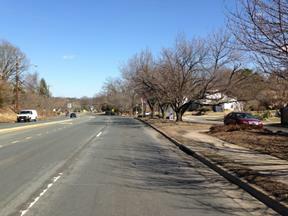 Examples: The two photos below depict poor intersection sight distance from the minor road stop line location. 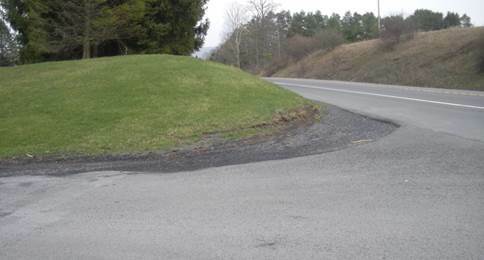 The sight distance in the first photo is obstructed by the embankment on the side of the road, and the intersection is also on the crest of a hill. In the second photo, the sight distance is obscured by trees and a utility pole. Intersection sight distance is restricted by an embankment. Source: VHB. Intersection sight distance is obstructed by trees and a utility pole. Source: VHB. Definition: Motorists are not provided sufficient information in the form of signs or markings to identify or navigate the intersection. Explanation: At some unsignalized intersections, the path or lane the motorist should follow may not be obvious, or the design and configuration may lead the motorist into a wrong path. This is often the case at unusual intersections, especially if there are no pavement markings delineating the lanes. The lack of a Street Name sign at the intersection can also be considered inadequate guidance. Examples: At the intersection shown in the following photo, motorists turning left from the major road onto the minor road often turn sharply and encroach into the opposing lane of the minor road. 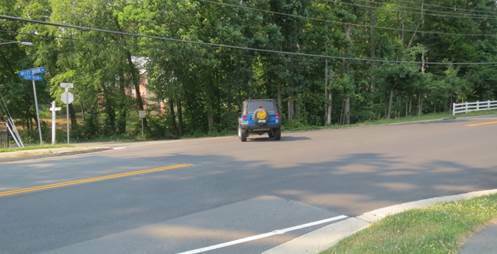 Providing dotted turn path pavement markings to delineate the correct turning path for the left-turning vehicle could help solve this problem. The vehicle is turning left into the path of opposing traffic on the minor street. Source: VHB. Another example of inadequate motorist guidance would be a median area of an unsignalized intersection on a divided roadway with no markings to define the lanes. This can result in motorists making undesirable driving maneuvers in the median, such as side-by side queuing, stopping at an angle, and encroaching on a through lane of the divided roadway. Lack of pavement markings to guide conflicting movements within median crossover. Source: VHB. Definition: The intersection is susceptible to frequent near-misses or conflicts and resulting collisions between vehicles due to a combination of traffic volumes, operating speeds, and turning movements at or near the intersection. Explanation: A conflict point is a location at which traffic paths routinely cross, merge, or diverge. By their very nature, conflict points are generally more prone to near-misses or collisions between vehicles than other locations on the road network. The number of conflict points at an intersection is dictated by its basic geometry—the number of approaches and the number of lanes per approach. For this reason, intersections with the same geometric conditions are generally considered to have the same number of conflict points. 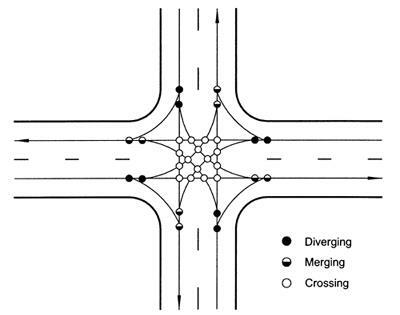 As an example, a conventional four-leg intersection of two-lane roads has 32 conflict points, as illustrated below. Illustration of conflict points at a conventional four-leg intersection. Source: FHWA. There are several factors that can amplify the potential for conflicts among vehicles at an intersection, such as adjacent land uses and access points (e.g., commercial driveways in close proximity to the intersection), heavy through volumes and/or turning movements, and high operating speeds on the approaches. Examples: A frontage road narrowly offset from its associated major road can add a significant number of conflict points to an intersection with a minor road, especially when the major road approaches are uncontrolled. Numerous conflict points at the intersection of this narrowly-offset frontage road and a minor road. Definition: Safety concerns exist related to the interactions between motorists and pedestrians or bicyclists at the intersection. Explanation: Non-motorists at unsignalized intersections are typically classified as either pedestrians or bicyclists. Not unlike motorcyclists, both groups are much smaller than passenger vehicles and more difficult to detect by drivers. Non-motorists can be particularly vulnerable to serious injuries at intersections at which vehicles on one or more approaches are not required to stop. This can be especially true for right turns (or left turns onto a one-way street), at which turning drivers may tend to look in only one direction to scan for conflicting vehicular traffic and not consider the potential for pedestrians and bicyclists to be in their path from the other direction. Safety issues confronting non-motorists are compounded by such conditions as high speeds and high through and turning volumes. The laws governing right-of-way for pedestrians crossing at intersections vary from state to state, with some always affording the right-of-way to pedestrians (regardless of whether a marked crosswalk is present) and others not. Some state laws also mention that an intersection is only a legal pedestrian crossing if it is the extension of the sidewalks on both sides of the street and/or if a marked crosswalk is present. The fact that a pedestrian has the legal right-of-way at the intersection does not negate any related safety concern—especially when that pedestrian is a child, of advanced age, or an individual with mobility restrictions. Example: The image below shows an example of a vehicle that stopped beyond the stop line and encroached upon pedestrians in a crosswalk. Vehicle encroaching on pedestrians in crosswalk at an ALL WAY STOP. Source: Lee Engineering, LLC. Definition: Users on the minor street frequently experience long delays in making crossing or turning maneuvers because of the lack of safe gaps in the major road traffic flow; this can also apply to motorists desiring to turn left from the major street. Explanation: The operational efficiency of an unsignalized intersection will naturally decrease as its traffic volume increases. High traffic volumes on the major road can cause significant delay for minor road drivers seeking to enter or cross the intersection, as well as for major road drivers looking for a gap in traffic to make a left- or U-turn maneuver. 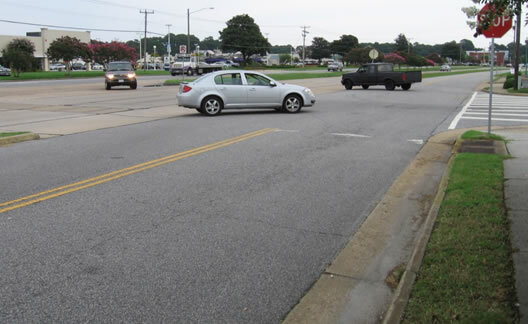 Example: The image below shows an example of a driver on the minor road waiting to make a left-turn onto the major road, which is a busy four-lane divided roadway. After waiting for several minutes and unable to find a suitable gap in traffic, this driver ultimately chose to make a right-turn instead of a left-turn. Vehicle on minor road waiting to enter major road. Source: Lee Engineering, LLC. Definition: Heavy volumes, high speeds, limited visibility—or some combination thereof—along the major street inhibits the drivers’ ability to safely judge suitable gaps in traffic for crossing or turning maneuvers. Explanation: All unsignalized intersections having at least one uncontrolled approach will present the following condition to drivers on the other approaches: they must wait for a gap in traffic that will allow them to safely complete their maneuver. One of the most frequent requests that local officials receive from citizens is for a traffic signal to be installed at a specific intersection to allow easier access onto the major road. Finding a suitable gap in traffic becomes more of a challenge as traffic volumes along the uncontrolled major road approaches increase, and this challenge can be compounded further by high running speeds and limited visibility along the major road. As delay incurred along the minor road increases, there is a natural tendency for drivers to accept shorter and shorter gaps in the major road traffic stream to complete their crossing or turning maneuvers. When those accepted gaps become small enough, the actions of the minor road driver will require an immediate reaction from the major road driver to avoid a collision between the two. An unsignalized intersection may be characterized by this problem during much of the day or only at certain times of the day. This problem can also be experienced by pedestrians seeking to cross the major road. Even when at a crosswalk where state law gives them the legal right-of-way, pedestrians will often wait for vehicular traffic to stop completely before initiating their crossing. Similar to the observed behavior among drivers, pedestrians tend to become increasingly willing to accept shorter gaps in traffic as their wait times increase. 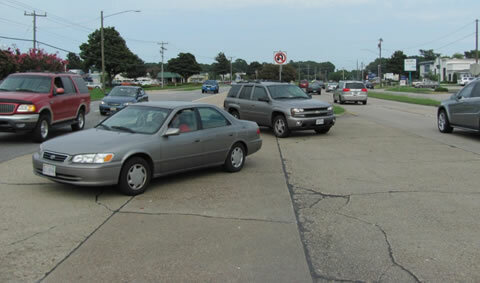 Some drivers (e.g., senior and younger drivers) may be more prone than others to misjudge the available gap in major road traffic for crossing or turning at an intersection. This can occur regardless of the traffic volume. The minimum required gap times vary by the type of vehicle entering the intersection, the speed of the major street traffic, and the maneuver (i.e., left turn, right turn, and cross), and range from as low as 6.5 seconds for right-turning passenger cars to as high as almost 12 seconds for large trucks turning left. Evidence of gap misjudgment can be gleaned from the police narrative within crash reports and seen during field surveys by observing major road vehicles having to quickly decelerate to avoid crashing with vehicles entering from the minor road. Definition: A significant percentage of motorists is traveling over the posted speed limit to create an unsafe condition for road users, or the posted speed limit is not appropriate for the roadway conditions and use of the road. Explanation: Speeding may be defined as driving over the posted speed limit or driving too fast for conditions—which include not only scenarios of wet or icy pavement, fog, and dark conditions but also extend to clear, dry, and well-lit conditions. As vehicle speed increases, the time and distance required to perceive and safely react to a potentially hazardous condition on the roadway also increases. For this reason, speeding can exacerbate practically every other type of problem at an unsignalized intersection. While speeding is typically treated as a corridor problem, the consequences of speeding are amplified at intersections due to the convergence of multiple traffic paths and types of users there. 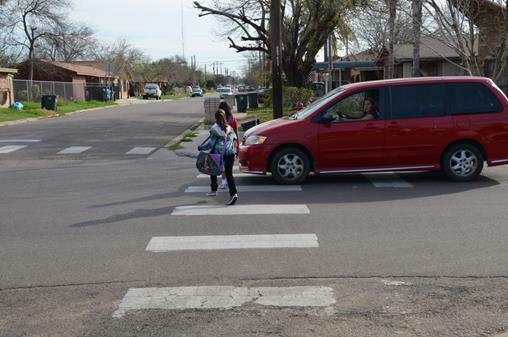 The impacts of speed on safety can be more glaring at unsignalized intersections that are frequented by more vulnerable users—such as children, the elderly, and individuals with limited vision or mobility restrictions. Another issue related to the speed limit is how clearly it is conveyed to users. While the speed limit is clearly posted along many roads, others may be characterized by few signs and instead rely on drivers’ awareness of a statutory speed limit that applies across a jurisdiction unless another speed limit is clearly posted. 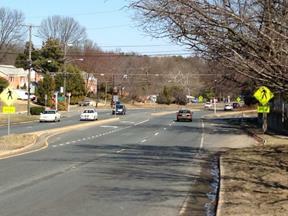 As an example, many residential streets tend to have a 25 mph speed limit, which may or may not be posted. The basic rule found in the Uniform Vehicle Code—and presumably in most individual state vehicle codes—is that every person shall drive at a reasonable and prudent speed when approaching and crossing an intersection. 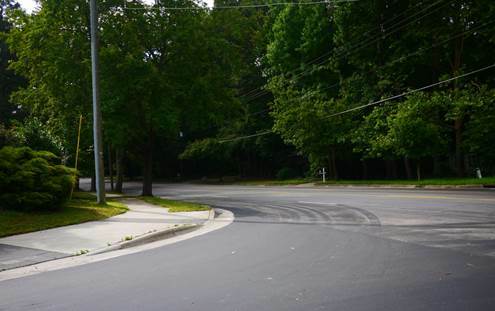 In addition to complaints from the public and crash reports that cite speeding as a contributing factor, skid marks along the intersection approach may suggest a speeding problem. Definition: There is evidence of frequent violations of traffic laws associated with the intersection traffic control devices and observance of right-of-way. State or local laws written in accordance with the "Uniform Vehicle Code" (see Section 1A.11) establish the right-of-way rule at intersections having no regulatory traffic control signs such that the driver of a vehicle approaching an intersection must yield the right-of-way to any vehicle or pedestrian already in the intersection. When two vehicles approach an intersection from different streets or highways at approximately the same time, the right-of-way rule requires the driver of the vehicle on the left to yield the right-of-way to the vehicle on the right. Drivers are not the only intersection users who must obey traffic control devices and traffic laws. When traveling on a roadway, bicyclists are expected to follow all traffic laws that apply to motor vehicles—including compliance with STOP and YIELD signs and yielding the right-of-way to others, as appropriate. Pedestrians must also do their part in respecting the rules of the road by crossing in compliance with state laws, observing prohibited movements, and obeying all traffic control devices present at and near the intersection. Parking lane (if present) and the presence of parking near the intersection. Shoulder type and width (if not curbed). Left-turn lane presence and length. Right-turn lane presence and length. Median type and width (if present). Curb cuts and accessible ramps. Pavement surface and skid resistance. Roadside safety hardware (e.g., guardrail). One-way vs. two-way street operation. A number of resources contain standards and guidelines that direct the design and implementation of the intersection infrastructure. These include the AASHTO Green Book and Roadside Design Guide, the Roadway Design Manual and Roadway Standard Drawings (or equivalents) for each state department of transportation, and design and construction standards developed by many local jurisdictions. When one or more of these physical elements is absent or considered inadequate for the intersection conditions, then this may contribute to one of the problem types itemized above. Lack of left-turn lane. If there is no left-turn lane at the intersection, then the turning vehicle must decelerate (possibly to a complete stop) within the through travel lane. This condition results in vehicular conflicts—perhaps in the form of rear-end collisions—and increased delay. Impacts may be most severe at unsignalized intersections characterized by (1) uncontrolled major road approaches and (2) high speeds or heavy volumes. Lack of right-turn lane. Similar to the left-turn lane, a right-turning motorist must also decelerate (possibly to a complete stop) within the through travel lane if no right-turn lane is present. With this condition comes a greater likelihood of rear-end collisions and increased delay among users in the rightmost through lane. The two photos above show consecutive intersections providing access to the same residential community. Right-turning motorists must decelerate within the through lane at the intersection shown on the left, while the right-turn lane at the intersection shown on the right allows less interruption and conflict with trailing vehicles in the right through lane. Source: VHB. Insufficient or excessive curb return radius. The corner radius between two adjacent legs of the intersection should take into consideration the turning radius of the longest vehicle wheelbase expected to use the intersection on a regular basis. If the radius is too small, longer vehicles will likely encroach either onto the curb and beyond or into the opposing lane. Conversely, as the radius increases, three potential problems can arise: (1) pedestrians have a longer distance to cross the intersection, thereby increasing their exposure to vehicle conflicts; (2) YIELD and STOP signs tend to be placed toward the end of the curb return at an offset from the approaching motorists’ view; and (3) the speed of turning vehicles increases. Severe intersection skew angle. As the angle between the two adjacent legs becomes more acute, it is increasingly difficult for the driver (especially seniors) to view oncoming traffic, which makes the turning maneuver more hazardous. This deficiency is noted under the discussion of the inadequate intersection sight distance problem. 1. 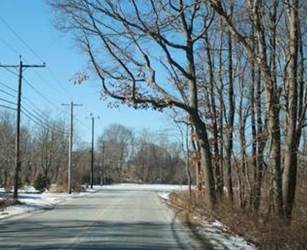 Speed Management: A Manual for Local Rural Road Owners, FHWA-SA-12-027, November 2012.